Twinkle, twinkle little star, how I wonder what you are …….. The first week of our advent giveaway has passed us by and now we are moving into the second. 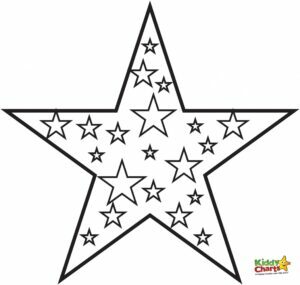 Can these star coloring pages shine their light brightly to get us through these busy forthcoming days? Today is Day 7 of our free Christmas coloring page downloads which are running on conjunction with our advent giveaway. It’s Sunday which is supposedly a day of rest but I’m not sure how many of mums get to rest on these busy weekends in the run up to Christmas. Do you have your tree up yet or are you doing it today? Whatever busyness life is passing you, take time to chill while the kids are decorating these stars.